Music Makers is presentation of contrasts. She Pon Top, Calypso Vickie, and Man In Dey interspersed, among others, with Cheek to Cheek, Clair De Lune and Let's Fall In Love. Classic calypso and ballroom style dance music. Then there is Volare somewhere in between. Add this compilation CD to your collection and buy a few more for gifts. 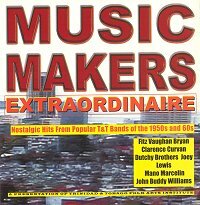 At long last we get the Dutchy Brothers, Clarence Curvan, John Buddy Williams, Joey Lewis, and Fitz Vaughn Bryan on a CD from a reputable producer. That, too, is a contrast in these days of wanton piracy. Ignore the other contrasts: the uneven remastering of some tracks, the blurry graphics and the inexplicable picture on the CD booklet of a recording that represents a proud period.